Thread: Why cant Microsoft make a dime on the Internet? Microsoft, one of the most aggressively competitive, brainiac-attracting, technologically superior, and oh, yes, cash-gushingly profitable companies of all time, can't for the life of it make a dime on the Internet. 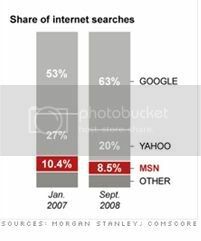 Everyone knows that Google remains the company of online advertising, generating operating profits of $1.7 billion last quarter on revenues of $5.5 billion. Yet even industry doormats Yahoo and AOL are profitable. 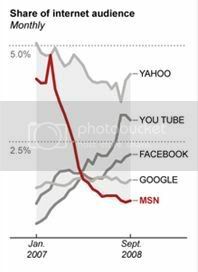 Desperate to catch Google, Microsoft has been spending like mad on data centers, people, and marketing. But its online audience is relatively small - much smaller than Google's - and those costs grossly outweigh sales. An interesting read at CNN. The current strategy is pretty strong, Microsoft missed the opportunity early on and now has to play catch up, considering they have the resources (money) they need to invest now to earn in coming years. I think the article writer isn't aware of the paid services that are going to come out in the near future, Azure, Sharepoint case in point. REF:-Why cant Microsoft make a dime on the Internet? Had DOS and came out with Windows 1. Now look where they are with the OS market. Give them anothe 5 - 10 Years and Google and Yahoo will be just a memory.